Are you thinking of getting away for the Foundation Day long weekend coming up in June? We have just one chalet now available for the holiday weekend which starts Friday May 31st. Pets are welcome! We look forward to seeing you and giving you a warm Misty Valley welcome soon! It’s a very special weekend in Denmark too, as we host the annual Festival of Voice from June 1-4. The festival is a remarkable collection of talent, and a celebration of voice, song and storytelling. Whatever your reason for travelling to Denmark, there is so much to see and do, we are sure you will want to return! Do you need a relaxing country getaway in stunning Denmark? 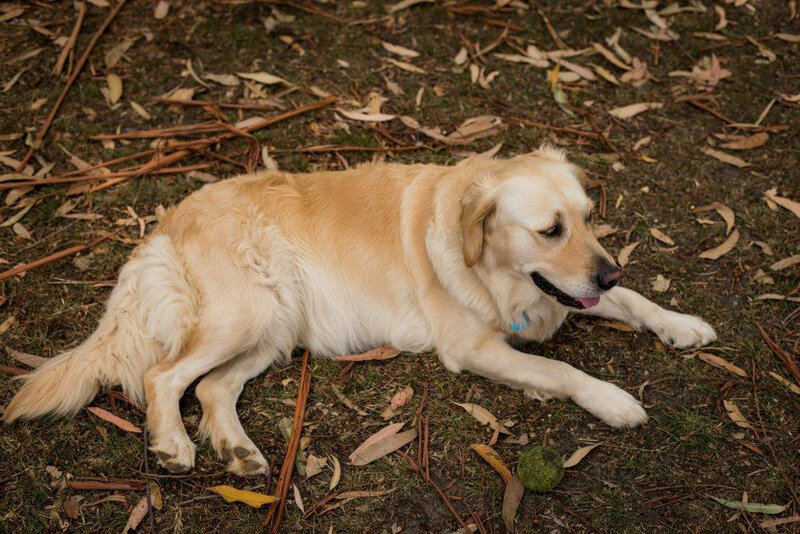 Are you looking for pet friendly accommodation? Stay in one of our fully self contained cedar lined cottages, set on 110 acres of natural bush and farmland. You will be close to all Denmark’s attractions, located just 10 minutes from the city centre. Even better, if you book in March, you can save $30 per night. Our February Getaway Special was so popular, we have decided to extend the offer into March as well! Stay three nights and receive a discount of $30.00 per night off our normal rates. This offer excludes public holidays and long weekends and finishes on March 31st. Check your dates for availability on our website, or call Warren and Leonie on 0428 409 239. The Labour Day Long Weekend is coming up soon, and one of our cottages is still available! Our two bedroom cottage is ready and waiting, if you would like to come and relax in beautiful Denmark for the weekend, while the weather is still perfect. There is always plenty to explore, see and do. After a day exploring the beaches or walk trails, why not kick back and enjoy the Rockcliffe Winery’s free music sessions from 4-7pm on Sunday evening? While you soak up the local wines and the atmosphere, the kids can play and enjoy delicious gelato icecream, made on site. Picnics are welcomed, so just ask if you would like one of Leonie’s amazing picnic platters to take along. Wow! It's great to know that we are getting it right. 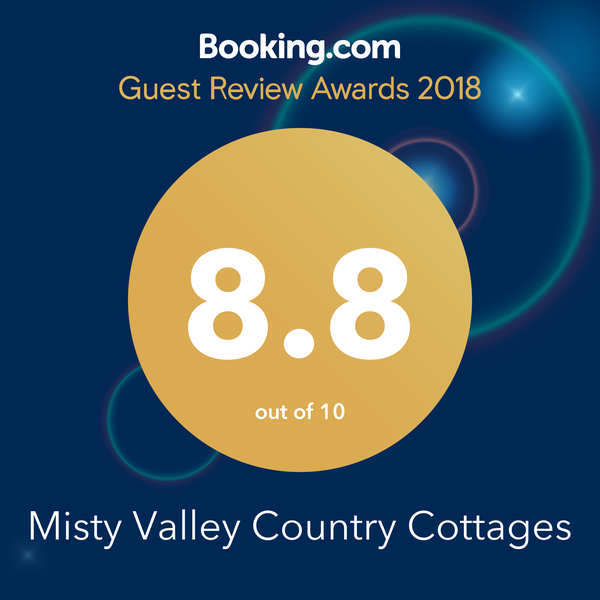 We just received notification that we are Guest Review Award winners at Booking.com, because of our great guest reviews. The truth is though, that this simply wouldn't be possible without you. A huge thank you to all our lovely guests, for taking the time to add their reviews. While its great to win, it's even better to know that we are genuinely making you, our guests super happy. It’s the kind of feedback that makes us feel fantastic. Want a getaway in February? Take advantage of our $30.00 discount special for the month of February! Stay three nights and receive a discount of $30.00 per night off the normal nightly rate. This offer starts February 1st and finishes February 28. It is subject to vailability and cannot be used in conjunction with another special. Enjoy some delicious freshly baked muffins to welcome you on arrival! These are our top 5 picks close to Misty Valley Country Cottages, that we suggest to our guests for keeping the kids occupied and entertained. Enjoy all the best of the south coast, there is plenty more to see and do, this is just a few to get you started! Perfect for a family picnic, with barbeque areas close by. A nature park with lots of room for the kids to explore. Green’s Pool is ideal for paddling and swimming for younger children, and scenic Elephant Rocks is a great place to take photos, walk, play in the sand, and take in the beach views. The $10 entry fee gets you lots of great outdoor thrills - ziplining through the trees, climbing, and zorbing - great fun for kids of all ages. Valley of the Giants Road, Walpole. Adults $21/kids $10.50. Family pass and concession available. Take the kids to marvel at the treetop walkway, and soak up the breathtaking walk through the Valley of the Giants. The Museum has free entry 10-4pm every day. Explore the replica of the Brig Amity, and the Discovery Centre to get a taste of the past with lots of hands on interactive exhibits for the kids. Albany Convict Gaol, $5 entry. Go back in time to the convict era, see inside the cells, and listen to stories of the convicts with the self guided tours. We still have some availability for January, from the 22nd onwards in both our Lake Mist and Autumn Mist Cottages. Would this suit you? Expect freshly baked muffins on arrival, and a warm country welcome you will remember, with private, self contained pet and disability friendly rustic chalets on 100 acres. If you enjoy a nice glass of wine, and appreciate the award winning wines from the south west, this month's special offer is for you! 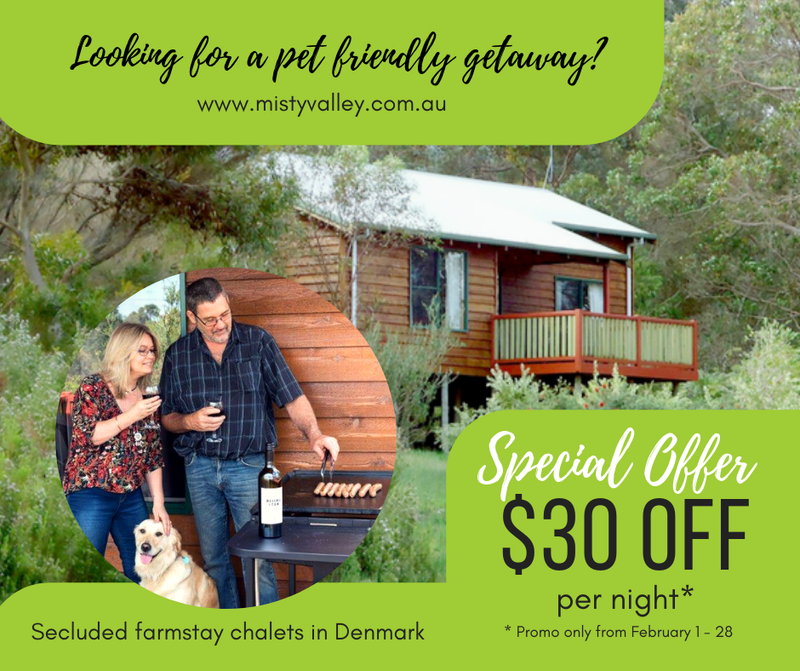 When you book your stay at Misty Valley Country Cottages Farmstay from May 1st to May 31st, if you stay two nights, you receive a complimentary bottle of local premium wine from the Lake House winery and restaurant Denmark. This offer is available Monday to Sunday but cannot be used in conjunction with another special. Call Warren and Leonie on (08) 9840 9239 to check your dates for availability! Young Bug Hunters and Forest Detectives required!